A video titled "The Importance of Appearances," by YouTube user norniTube, proves that we all may be too quick to judge a book by its cover. 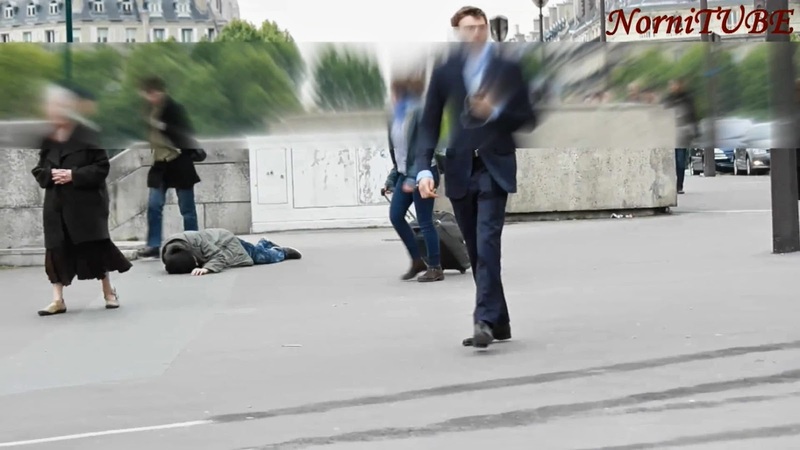 In a heartbreaking social experiment, a man dressed as a homeless person falls down in a busy street in Paris, France. Dozens of people pass by him, no one offering a hand. Then, a person dressed in a suit falls in the exact same location, appearing to be sick, and everyone jumps to his aid. The video claims the "homeless" man was lying on the street for more than five minutes without anyone offering help. Some of the passers-by stop to take a second look, but still do nothing. On the other hand, the man in a suit doesn't even need to cry for help before several people hurry to his side. While the "experiment" can't be 100% validated, it still shows an interesting, and unpleasant, side of human nature. The video also highlights an incident from 2008, when a woman collapsed in a waiting room of a New York City hospital, and the staff ignored her for 45 minutes. At one point in the video, a caption simply asks: "What if it was you?" A chilling thought considering any one of us could one day be on the wrong end of a snap judgement. Green, a Jamaican-born woman who had been involuntarily committed the previous morning and had waited overnight for a bed, stopped moving about half an hour after she collapsed. The New York City Health and Hospitals Corporation, which runs the hospital, said six people have been fired as a result of the incident, including security personnel and members of the medical staff. Mayor Michael Bloomberg said he was disgusted by the tape, and that the actions of the hospital staff were unacceptable. "I think what they said is, 'Oh well, people sleep on the floor all the time, and I didn't pay any attention,"' he said.